The Behringer QX1222USB ups the ante with six mono mic inputs. These two additional channels can also be used for stereo line-level devices, such as keyboards or sound modules. Building on the feature set of the two previous models, the QX1222USB comes equipped with channel Inserts for inputs 1-4, a stereo 7-band graphic EQ, which can be assigned to the main or monitor buses, and the proprietary FBQ Feedback Detection System. Enjoy the freedom of wireless mic functionality, thanks to the built-in ULM receiver port. Other features include full-sized faders for MON and FX SENDs, the XPQ 3D stereo surround effect (creates a broader, enhanced stereo image), and a handy Voice Canceler function for removing vocals from pre-recorded tapes and CDs for "instant-karaoke" applications. No matter what your audio mixing needs are, Behringer QX Series USB mixers provide the performance and features to take your talent to the next level, at a price sure to amaze you. Try one on today -- they've got one in your size! Nothing adds the finishing touch to a live or recorded performance like really good effects, so they equipped a select group of these mixers with one of the best FX engines in the industry. Designed by the world-renowned KLARK TEKNIK engineering team, these high-end FX processors feature 32 studio-grade presets with dual addressable parameters, Tap function and storable user parameter settings. Complete with its own dedicated level meter, these effects provide a wide range of enhancement options, from sweet and mild to absolutely wild! 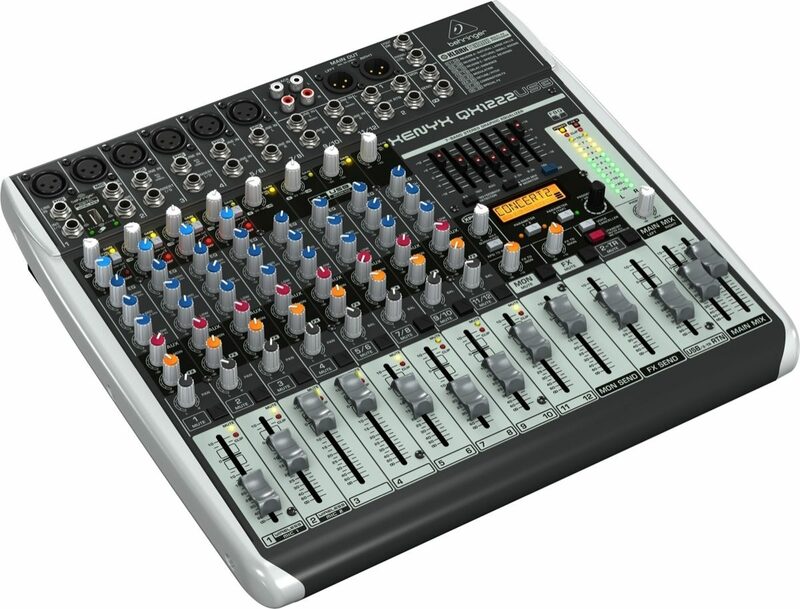 The QX1222USB mixer is "wireless-ready" right out of the box. The Ultralink ULM100 (sold separately) is a high-quality 2.4 GHz wireless mic, plus a receiver dongle that connects directly to a dedicated input port on the top of the mixer. If you want to operate with an additional microphone, the Ultralink ULM200 (also sold separately) comes with two hand-held microphones and a special 2-channel USB receiver. These technologic breakthroughs make for seamless wireless integration that is easier and more affordable than ever. Ask professional sound engineers what their favorite piece of external processing gear is and the response will be virtually unanimous - dynamic compression. What's compression? Glad you asked. Compression limits the dynamic range of a signal, lowering the level of loud sounds and turning up softer sounds to achieve sonic balance. But applying compression is a delicate art that many novice, and even intermediate sound techs have difficulty mastering. The "one-knob" compression is available on all mono channels and is easy to operate, even for entry-level users. Now you can easily dial in the perfect amount of compression for instruments and vocals, creating powerful mixes with punch and clarity. 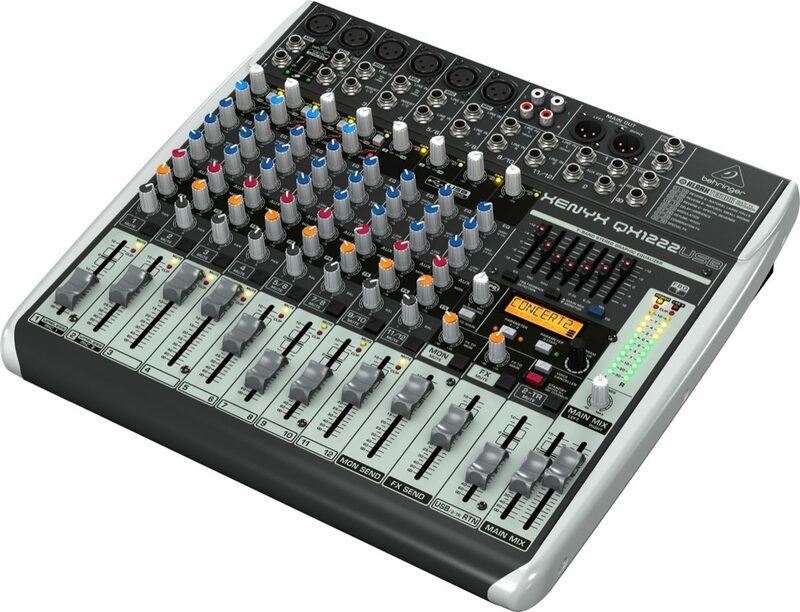 The "one-knob" compressors come standard on each and every XENYX Q Series USB mixer. All XENYX mixers have one thing in common; great-sounding, high headroom XENYX mic preamps. These state-of-the-art mic preamps are a tremendous step in the evolution of audio technology-- and they can easily hold their own, even when compared to expensive, boutique-style mic preamps. XENYX preamps offer a staggering 130 dB of dynamic range with a bandwidth that extends from below 10 Hz to well above 200 kHz. As a result, XENYX mixers provide such transparent, crystal-clear performance that you just might think someone upgraded your microphones while you weren't looking. There was a time when the recording process called for lots of specialized gear, which meant the average musician had to buy time at a recording studio--and that time was expensive! But modern technology has put personal recording well within the reach of virtually anyone with access to a computer. But how do you get all that music flying around your brain into a computer? 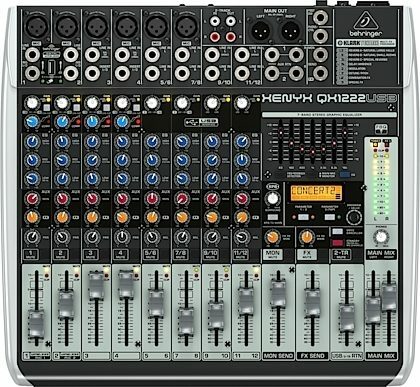 That's where XENYX Q Series mixers come in. Thanks to the built-in, bi-directional stereo USB audio interface, you can connect directly to your PC or Mac computer via a single USB cable. Now any signal source connected to the mixer can be recorded straight to your hard drive. 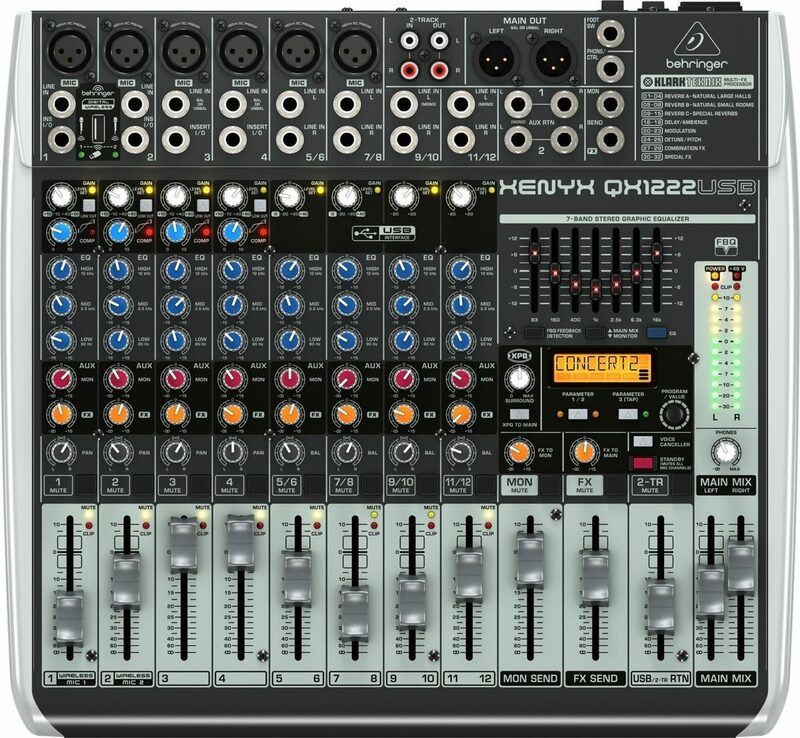 Because you'll want to take full advantage of your XENYX QX Series mixers' recording and podcasting potential, they've put together a massive software download at www.Behringer. com that includes Audacity (the most popular open source audio editor), Podifier, Juice, Podnova and Golden Ear (a great selection of podcasting software). You're ready to go live on your PC or Mac right out of the box! You also get more than 100 virtual instruments and 50 FX plug-ins, turning your computer into a complete home-based or mobile recording studio. Overall: I have only had this board for few weeks, but so far it has been incredible! The FX are crisp and clean. The board functions easy to get use to and the USB option is excellent! I would recommend this board to anyone starting out and even to those that are experienced. Will be trying the recording feature soon at a live show, once i download the software! Overall: Im very happy with this mixing board, the sound effects are amazing and very easy to adjust and apply.i know some people put down behringer products, but i have quite a few and have only good things to say about this company, never had 1 problem with anything. as far as this board is concerned..it has made recording and playing so much easier and fun.the usb plugs right into the computer and play...that simple.the EQ sounds stellar and really makes a huge difference in the sound quality of my music. for the price, you cannot beat it...i totally recommend this mixing board to anyone who wants to increase the quality of there sound. Style of Music: Rock, Metal, classic Rock, Blues.